The Certified Companies recognised for providing world-class employee conditions, joined together at the Old Billingsgate, on the 1st February 2018 in London, to celebrate their achievements during an invitation-only gala dinner. This year, there are 85 Certified Top Employers – 12 of them are newly certified and six of them have been named a Top Employer for over ten years. Newly certified organisations include DHL Supply Chain, global leader in supply chain management, and OVO Energy Ltd, one of the UK’s leading energy supply companies. “Congratulations to our 2018 Top Employers! Each year organisations face new challenges and the past year has been particularly challenging, with the march of technology and uncertainty around Brexit driving major organisational change. But our Top Employers continue to achieve the very highest standards of excellence in employee conditions and are really getting creative in terms of motivating, inspiring and retaining their teams. Research from the Top Employers Institute shows the Top Employers in the UK evaluate talent strategy in relation to business performance. They also provide a thorough onboarding programme when new employees start and continue to support them by helping employees monitor their own performance and manage their career development. 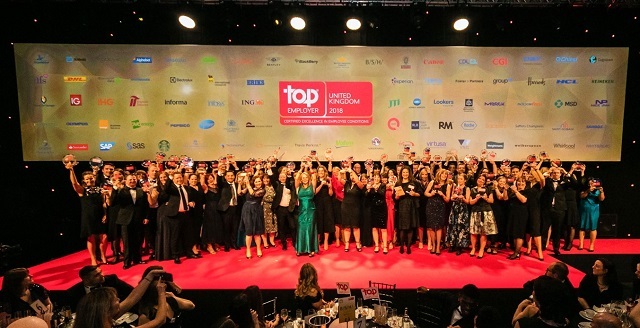 Now in its 27th year, the Top Employers Institute Certification recognises leading organisations around the world for their commitment to their employees and fantastic people practices. AbbVie – a pharmaceutical company that discovers, develops and markets both biopharmaceuticals and small molecule drugs. BlackBerry UK Ltd – multinational company specialising in enterprise software and the Internet of things. DHL Supply Chain – global leader in supply chain management. Imperial Tobacco Group – a British multinational tobacco company. Infosys – a global leader in technology services & consulting, helps clients in more than 50 countries to create & execute digital transformation strategies. Konica Minolta Business Solutions (UK) Ltd – providing technological solutions to businesses. MSD – Global healthcare leader providing innovative medicines, vaccines, therapies, animal health products and solutions. Olympus Surgical Technologies Europe-UK – medical equipment manufacturers. SAS – leader in analytics. Starbucks Coffee Company UK – an American coffee company. Whirlpool Corporation – an American multinational manufacturer and marketer of home appliances. Saffery Champness – one of the UK's Top 20 accountancy practices. HCL Technologies Limited – an Indian multinational IT services company. J D Wetherspoon – award-winning pub and hotels. Rider Levett Bucknall – an independent, global property and construction practice. RM Plc – provides products, services and solutions to the UK and international education markets. Weightmans – a top 45 UK law firm. The first step in the certification process is participation in the HR Best Practices Survey: a comprehensive analysis of the organisation’s Human Resources environment. The Top Employers Institute then validates the answers and documents provided to ensure they accurately reflect the organisation’s employee conditions. After the validation of participants’ surveys, a third-party audit is conducted to ensure the integrity of the Top Employers Institute’s procedures, processes, systems and data. All participants must attain the international rating standard required for certification.